Ever since his childhood in Nyssa, Oregon, Ken Schilling has had a special rapport with dogs. "I trained my first dog when I was seven," he notes. Schilling joined the army after seeing a recruiting poster for the military dog detachment. "At first they sent me to an artillery unit," he says. "I harrassed them until I got transferred." When he got out in 1976, Schilling trained at Madelyn Kennels in Bakersfield, then built a kennel in San Benito, Texas, where he met his wife Lynn. He studied curriculum design at Texas A&M to develop a course for police officers working with dogs for tracking and narcotics detection. 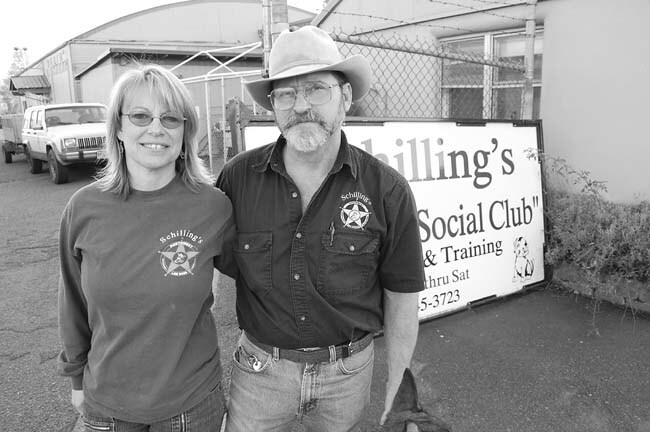 In 1995, the Schillings moved to Oregon and opened Schilling's Northwest Law Dogs in Eugene, offering classes in obedience, personal protection, and assistance for handicapped people. In 2001, Lynn joined the business full-time to add day-care, aka the K9 Social Club, to the menu. "Problem dogs have been my specialty," says Schilling, whose training method balances praise, reward, and discipline to develop a partnership between dog and owner. Learn more at schillinglawdog.com.